Moreover, the region is also witnessing an increasing link of disasters to climate change with increasing sea levels and rising water temperatures. Disaster Risk Management (DRM) is, therefore, one of its priority areas and its Action Plan (2017-2021) has specific goals to improve resilience in IORA countries. Towards this, it encourages partnerships between governments and institutions to strengthen this priority area through joint training programmes, sharing of experiences and best practices, capacity building and enhancing the technical capabilities within the region. 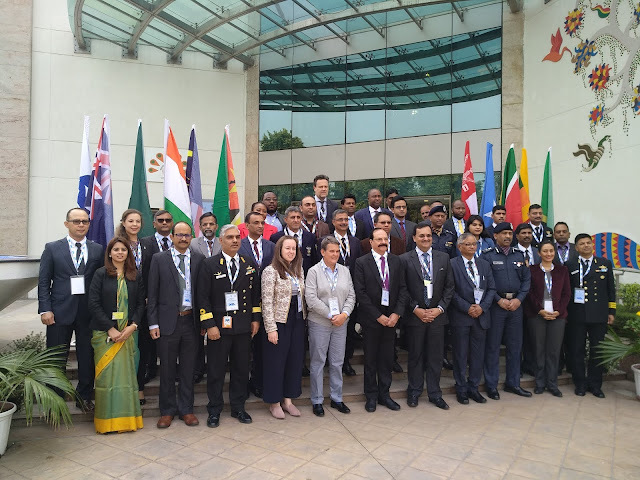 One such meeting of IORA Cluster Group on DRM was organised by the Ministry of External Affairs, Government of India, in collaboration with the National Disaster Management Authority (NDMA), National Disaster Response Force (NDRF) and Ministry of Home Affairs on 5-6 February 2019 in New Delhi. and the Indian Ocean Rim Association (IORA). The two-day meeting featured interactive sessions with a focus on the development of a draft Work Plan for DRM in IORA. It also deliberated on the need for establishing a DRM Core Group to take forward the agreed objectives under the Work Plan. Discussions on strengthening cooperation in disaster response interventions, including the deployment of response teams and mobilization of relief material to affected countries, were held. Besides, information exchange, sharing of best practices, data and early warning technologies were also discussed. A total of 36 delegates from eight Member States, including India, and the IORA Secretariat participated in this meeting. Senior officials of MHA, MEA, NDMA and NDRF were also present.